Range 1km 2 electrical motors 4h autonomy Payload 15kg is an Unmanned Surface Vehicle, catamaran type, with tele-operated and/or autonomous modes. Ultra portable (50 kg), it is the perfect platform for all kinds of investigations in shallow waters, above and below the surface. Thanks to its open architecture and its high speed PC to PC communication, all kinds of sensors running on Windows can be easily integrated to the Catarob. The shore control PC allows real time display and control of navigation and onboard sensors. Thanks to the open architecture of the on board PC, CatarobATS can embed various sensors such as sonars, echosounders and ADCP. Two LI-Ion accumulators integrated in the hulls give a full energy autonomy to Catarob-ATS, allowing up to 4h missions in the most remote areas. 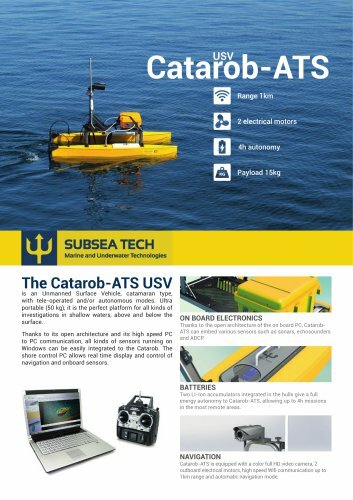 Catarob-ATS is equipped with a color full HD video camera, 2 outboard electrical motors, high speed Wifi communication up to 1km range and automatic navigation mode.